Despite not being part of my Fall 2012 Trend Report, the duo-tone will also be trending this fall. 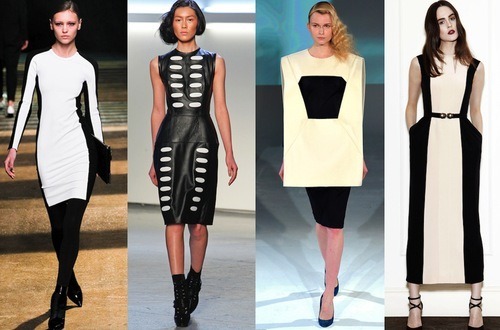 Seen on structured suits, fitted dresses and chunky coats, the black and white classic combination persists. This is my interpretation of the trend. A duo-toned fitted mini dress with cut-out details around the neckline styled with a black blazer, black flat ankle boots and a patent black Balenciaga clutch bag.